The Air wick Floor carpet powder is easy to use and leaves your house smelling fresh and clean. It makes the vacuum smell great too! I use this in conjunction with the carpet deodorising sprays. I really love this smell! I just shake it out evenly over carpets and rugs, let it sit for around 5 minutes and then vacuum. The only downside is that I have accidentally left it longer and it took several vacuums to pick up the white residue..also it can clog the vacuum filter. This is so easy to use and not only lifts and freshens the carpets and rugs, it also leaves the room smelling delicious! Great for eliminating strong cooking and pet odours! Vacuuming does a great job and lifts the carpet, but using this powder, sure does give a beautiful job with a welcome freshness in scent, which lasts for sometime. I found the fragrant didnt hang around long and didnt spread well which didnt cover big area. But it did smell great for a short time. 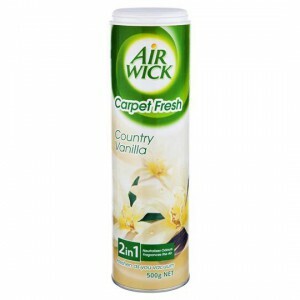 Air Wick Floor Carpet deodorant Vanilla is good for the rugs and mats when they need a little lift after a lot of use, particularly during wet weather. I scattered some of this Vanilla Floor Carpet Deodorant and the smell was quite pleasant although after going over it several times with my vacuum cleaner it seemed to still be everywhere. I don’t like it that I still have powder residue on my rug. My vacuum is new and works well. I used this when we had an issue with smelly carpet after a failed dry cleaner cleaned my carpets. The smell is strong but doesn’t last very long. You need a powerful vaccum to clean up the powder. How would you rate Air Wick Floor Carpet Deodorant Vanilla?